Angora Rabbits are thought to have first come to Europe from Turkey, over 300 years ago. Small Angora industries have developed in France, Germany and Finland, but the market for Angora fibre is dominated by the Chinese who farm the rabbits intensively and are able to produce the fibre more cost effectively using cheap labour. Here at Bigwigs in the Yorkshire Dales, the rabbits have recently moved from the stone barns that surround our beef & sheep farm, into a new light & airy purpose built shed. The does (females) live in colonies, bedded on straw, in pens on the shed floor and the bucks (males) are kept, depending on their age, in either small groups or in individual pens, also in the shed. We find that as long as the rabbits are kept clean and dry there is very little need for grooming and the fibre can be carefully harvested by clipping with scissors every 14-16 weeks. Bigwigs Angoras are the Continental type Angora rabbit, (rather than the smaller English variety). They can be many different colours, producing fibre that is White, Cream, Gold, Grey or Chocolate. Angora hair grows approximately 1 inch each month and needs to be clipped from the rabbit every 14 – 16 weeks. Without clipping the coat becomes matted, the rabbit becomes uncomfortable and the precious fibre is wasted. At Bigwigs the rabbits are clipped using scissors. 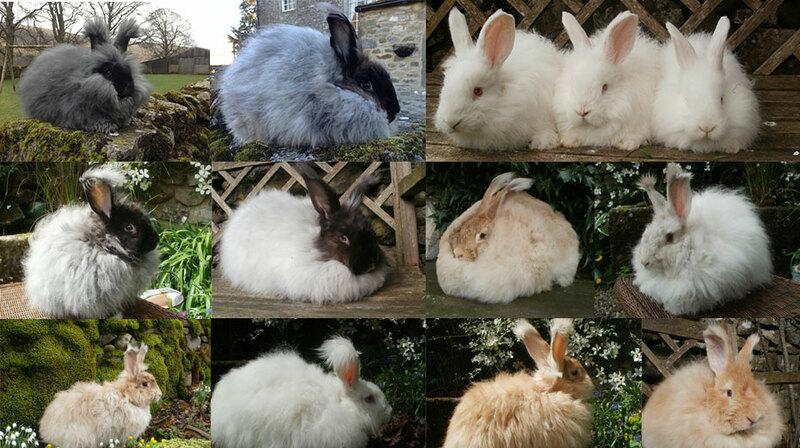 The rabbits usually enjoy their haircuts and sit quietly on my knee as they are first groomed then the hair is parted along the back and cut in small sections so the fibre can be sorted into length – ideally the fibres should be between 2” and 3” for spinning with the shorter fibres being suitable for felting. Prior to felting or spinning, all fibre should be free from ‘foreign matter’ – this is usually hay, straw or dried muck pellets. There should be no knotted fibre included in material for spinning, but depending on the project, they can be included in felt. Bigwig’s fibre for felting is supplied knot free, but if you require knots for a particular project please ask! Bigwigs fibre for spinning and felting is currently available in 7 natural colours; White, Gold (fawn), Oatmeal (Gold/Grey), Agouti (Dark grey/Gold), Silver (Pale grey), Smoke (Grey) and Sable (Brown). Bigwigs spinning fibre is commercially spun at a mini mill specialising in processing small quantities. Prior to spinning the fibre is carded and blended with sheep’s wool, either British Bluefaced Leicester, or ethically sourced Merino. The current range of yarn contains 25% Bigwigs Angora in natural and dyed shades. All the yarns are spun to 4ply specifications but should be handled as a double knit to allow the angora room to bloom! The suggested tension is 20sts/28 rows/ 10cm, using 4-4.5mm needles. Angora is widely recognised as the warmest of natural fibres and the luxury of its extreme softness makes it a joy to wear – ‘soft as thistledown, light as a feather, warmer than wool’. Whatever you create with your Bigwigs Angora, we hope that you enjoy its simple, natural, luxury. Washing: Garments must be washed by hand. Gently wash with mild soap in luke warm water, rinse twice then short spin in the washing machine. Pat into shape and dry flat. Felting: Angora fibre is used to make the best quality felt hats! It is also easy to make knitted felt in the washing machine with our yarns. If you do not want your garment to felt, we recommend that you do not knit a style with tight fitting armholes and do not wear your garment under a cagoule or similar coat where the warm, moist environment will encourage felting and shrinkage. 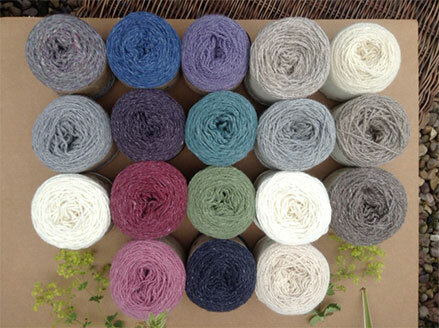 Dyeing: Our yarns are available in dyed and natural colours. The natural coloured yarns can easily be dyed to your own specifications with an appropriate product for natural fibres.